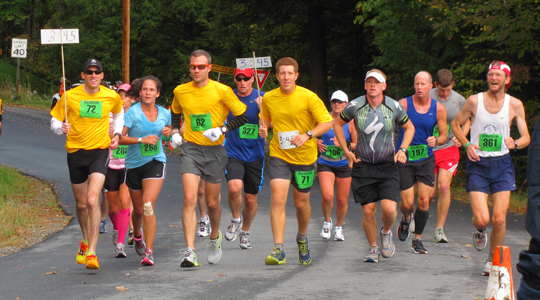 The Pace Bears cordially invite you to meet your marathon goals with the help of their Adirondack backwoods experience. Whether you are aiming for a 3:30, 3:45, 4:00, 4:15, 4:30, 4:45, 5:00, 5:15, or 5:30 finish, these bears are fully carbo loaded and ready to help you. Stop by the Expo to sign up, or feel free to join your preferred Bear at the start or anytime during the marathon. What is the difference between Pace Bears and Pace Rabbits? While Pace Rabbits are frequently professionals who help world-class competitors break records, Pace Bears are volunteers who are dedicated to helping you reach your time goal. Unlike skittery rabbits, who jump ship once the finish draws close, Pace Bears are in it for the long haul and will cross the line with you. Our pacers hail from across the US and into Canada. They have all run hilly marathons at a pace considerably faster than their Pace Team effort. Why should I join up with a Pace Bear? In true “leave the driving to us style” you can leave the decisions and math calculations to someone else and concentrate on putting one foot in front of the other. Pace Bears are part runners, part counselors, part storytellers and traveling in a group will make the journey fly by. Actually, there is no sign up. Pace Bears will gather at the start line 30 minutes before the race, wearing their Pace Bear T-shirt and carrying their pace sign. Simply select your time and choose your Bear. Brief bios can be found on the race website. The best way to select the proper pace group is to consult the Race Prediction charts at www.MarathonGuide.com There you can base your desired finish time on a previous shorter race you’ve completed THIS SEASON, not last year. Will the Pace Bears run even splits? Pace Bears are experienced runners and know enough not to take you out too fast and burn up all your energy. Cumulative mile splits will be on target. Individual miles less so depending on the number of ups and downs in each particular mile. What should I do race morning? Pacers will assemble at the start about 30 minutes before the race. Select your appropriate time and choose your leader—most time slots will have at least 2 leaders. Around 15 minutes before the start the Pace Bear will give you some last minute instructions. They discuss the course profile, what to do if you need a break, and how they plan to handle the water stops. Now is the time to ask any last-minute questions you may have. If you need a porta pottie break or need to tie a shoe lace, or find it difficult to stick to pace, the group will NOT wait for you. In the case of the first two, you most likely will be able to catch up. In the case of all three, you can always join the pace group behind yours. The Pace Bear is big and needs to drink too! The pace will slow a bit during the water stops. As a group you may decide to skip some or to drink on the run. That is a question to ask your individual pacer before the race. If I join a pace group do I have to stay with them for the entire marathon? Nope. If you decide you’d rather go solo or drop down to a slower pace group, feel free to do so. Before dropping down, consult with your Pace Bear for some strategies to help you reach the end. If you’re not having a great day, slow down, take some walking breaks and reset your goals. Can I join a pace group during the race? As you cross the finish line, raise your hands in celebration and smile for the cameras! Sign autographs! Thank your Pace Bear and congratulate your fellow travelers. Walk around a bit so your muscles don’t seize up. Shed your shoes, cool your legs in the lake. Change clothes. Eat! Celebrate! If you are interested in joining our Pace Bear Team, please email Laura Clark at laura@saratogastryders.org or phone 518-581-1278.